"Skirt steak comes from the short plate. It comes in a long, thin strip or 'skirt'. Sometimes it's hard to find, so if you don't see it out with the other meats, ask your butcher." Cut the skirt steak into individual strips for serving. Add the garlic to the teriyaki sauce. In a re-sealable plastic bag, combine the steak and the sauce. Seal tightly and refrigerate to marinate overnight. Preheat oven to broil OR preheat a barbecue grill. When oven OR grill is ready, remove meat from bag and discard remaining marinade. Place meat on a broiler pan for the oven OR directly on the grill for the barbecue. Cook for about 5 minutes per side, or to desired doneness. See how to make a tasty teriyaki marinade for grilled flank steak. 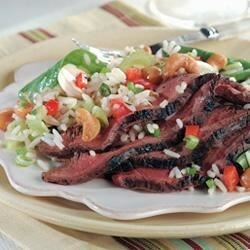 I loved the marinade-however, I would not use skirt steak for this recipe. Next time I make it, I will use T-bones or filets. Very easy and good grilled on my George Foreman grill. Only needed 1 cup of teriyaki sauce. This was really easy to do. The steak was good, but I don't see that the garlic added that much to the store bought teriyaki sauce. I made this for a few friends and they all loved it. it was easy to prepare and cook. i didn't marinate over night, i poked holes in the steak and marinated it for 30 minutes. it came out great. For best results, don't skimp on the teriyaki, use the full amount at least..make sure you marinate it long enough. Also GREAT on the BBQ! !